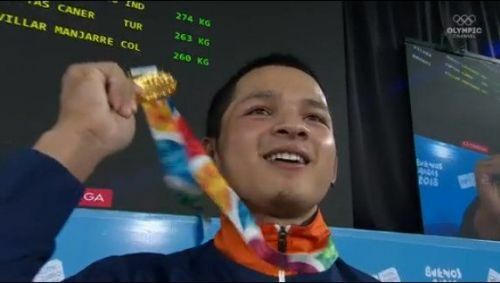 India woke up to delightful news as weightlifter Jeremy Lalrinnunga grabbed India’s first ever gold medal at the Youth Olympics in the early hours of Tuesday morning. The 15-year-old, who hails from Aizawl, lifted a career-best total of 274kg (124 kg +150 kg) to finish on top of the podium in men’s 62kg category. Until Monday, the Mizo wunderkind had a personal best of 273 kg, which he had accomplished at a NIS Patiala event. There had never been any doubt about Jeremy’s immense talent. While honing his skills at the Army Sports Institute for the past two years, he has been proving his mettle in different youth competitions around the world. He already has two silver medals from the World Youth Championships in 2016 and 2017, and he aspires to win an Olympic medal. The silver went to Toptas Caner of Turkey, who lifted 263kg, and the bronze was clinched by Estiven Jose Manjarres of Colombia for a total lift of 260kg. Earlier in the day, Commonwealth Games silver medallist shooter Mehuli Ghosh had to settle for the silver medal in women's 10m air rifle. A 9.1 in her final shot forced her to finish with 248.0 behind Denmark’s Stephanie Grundsoee, who registered 248.7. The 18-year-old Ghosh had earlier shot brilliantly to top the qualifying round with a score of 628.8. Despite continuing with the momentum in the final and leading the field till the very end, her poor score of 9.1 was what did her in as the Danish shooter produced a spectacular 10.4. In the past two editions, India had never won a gold at the Youth Olympics. India’s best show so far has been at the inaugural edition in 2010, where Indian athletes went on to claim six silver medals and two bronze. India followed it up with two more medals from Nanjing in 2014 -- a silver and a bronze. Earlier, India made a thunderous start to Youth Olympics 2018 by winning two silver medals on the very first day through shooter Tushar Mane and judoka Tababi Devi Thangjam. With the kind of promise India has shown in just the first two days of the competition this time, more medals are definitely in store.